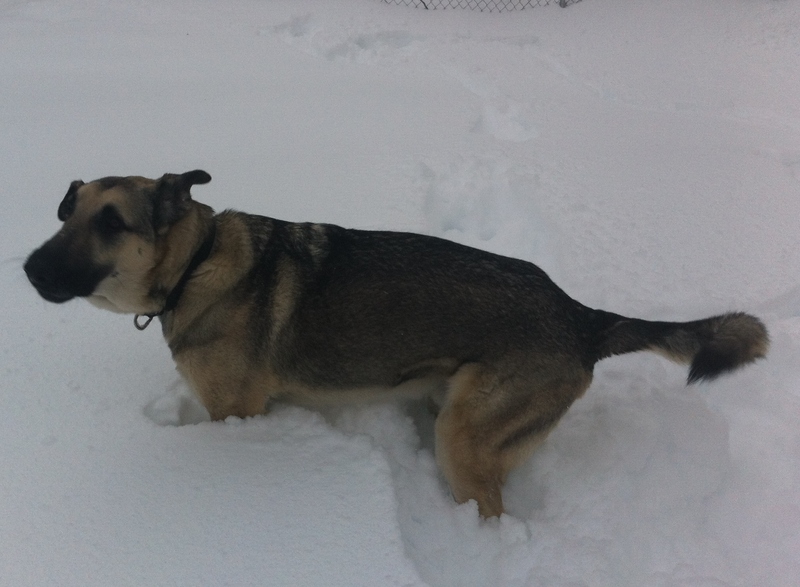 My German Shepherd Rodney loves the snow, but even he has had a bit much of bad weather this winter. This was obvious during a recent ice storm when he went out for his daily constitutional, squatted and got a look of sheer desperation as his long legs slid away from his body in different directions. He reminded me of Bambi on ice. If that weren’t humiliating enough, he recently had to contend with a nearly two feet of snow in the backyard. Normally, that’s where he relieves himself between walks. But the amount of snow which fell last week prohibited him from lifting his leg. The look on his face as he tried to make due was absolutely doleful. The look on my face was one of absolute amusement. Posted on February 17, 2014, in Family, My life, perspective and tagged 365 reasons to smile, Dogs, ice, life, musings, pets, smiles, snow, Thoughts, winter. Bookmark the permalink. 24 Comments. Awww….poor boy emasculated by the snow. It’ll thaw out soon Rodney! He seems to have overcome his disgrace. Oh, poor Rodney! I can almost feel his embarrassment!